Mooney Farms is the largest producer of sun dried tomatos in the U.S. and they were founded in 1987. Mooney Farms has been handed down from generation to generation. Their family recipe for sun dried tomatoes packed in olive oil has never changed. Once you try their sun dried tomatoes everything will change! Every product they make is handcrafted in true Mediterranean tradition using a plethora of fresh ingredients from Northern California. 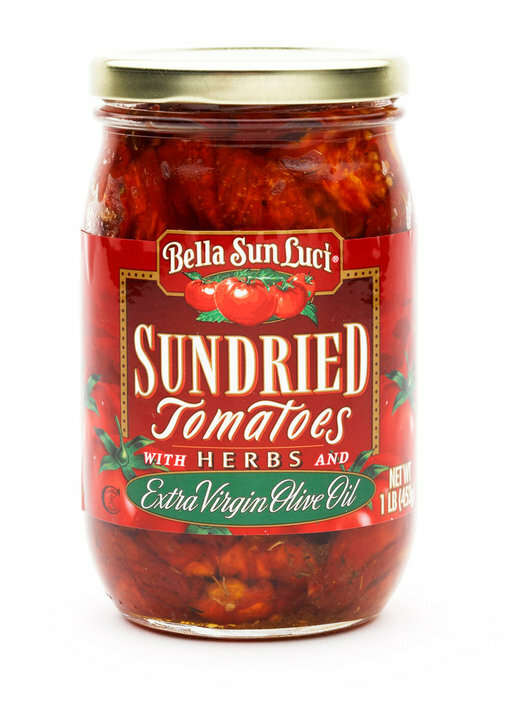 Mooney Farms Bella Sun Luci sun dried tomato products are some of the best I have ever smelled, tasted and seen. Tomato lovers, eat your heart out! I don't think my pantry will ever be without at least one Bella Sun Luci product. Inspired by their fresh, sweet and totally phenomenal flavor I created a quick and easy recipe with the help of my 6 year old son whom I like to refer to as my "mini chef". This recipe will disappear within minutes. Sun dried tomatoes contain Lycopene a phytochemical and proven antioxidant that fights free radicals in the body. Ounce per ounce sun dried tomatoes have 12 times the amount of Lycopene than a raw tomato! So eat to your good health! Make muffin mix according to the package but be sure to use 1 Tbsp less of oil. Mix in the Bella Sun Luci Bruschetta, cheese shreds and cream cheese. Scoop into a greased muffin tin. Bake according to directions but I suggest going a couple minutes less. Cool in the pan for 3 minutes before transferring to a rack to cool completely. 2010 Olive Oil Competition Gold Award Yolo County Fair, 2010 Northern California Small Business Persons of the Year, American Building Company 2010 "Building of the Year," PMA 2010 Best of Show Inline Booth, Women's Health 125 Best Packaged Foods for women 2010. I was sent the product(s) free of charge by the company or PR representative. It has been used solely for the purpose of this honest review. The views are strictly 100% my own. Receiving the product did not influence me to produce a positive review.